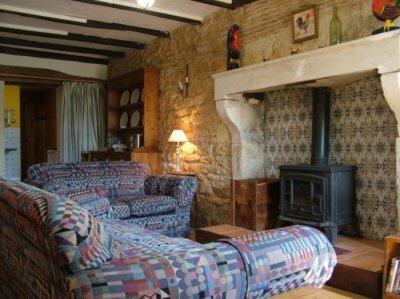 Description of Property: Sunrise Cottage is one of two on site, alongside our house. The whole property is set in an acre of garden. Sunrise has a lounge/diner, kitchen and shower room downstairs. 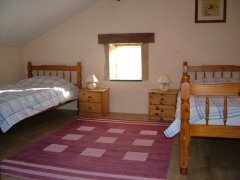 Upstairs are one double bedroom, one twin and one single. The cottage is comfortably furnished. In the lounge area is a large Charentaise fireplace with woodburner. Seating is a 3 seater and a 2 seater sofa. There is a mini hi fi with CD, tape player and radio and a TV/DVD player and a selection of books, videos and games. The dining area has a large farmhouse table which seats 5 and a sideboard with all the crockery, cutlery, glasses and dishes that you will need. There is high chair for a baby/toddler. In the kitchen is a double sink unit, gas cooker, microwave, fridge, freezer and washing machine, toaster and all the necessary pans and utensils. The shower room has a shower cubicle, WC and washbasin. Upstairs there is a double room, twin room and a single room. Plenty of wardrobe space and chests of drawers. Outside Amenities: The front of the cottage is south facing with a patio. There is garden furniture, parasols and a barbecue. Surrounding the whole property is an acre of garden which is fenced and gated. The property has plenty of parking space. 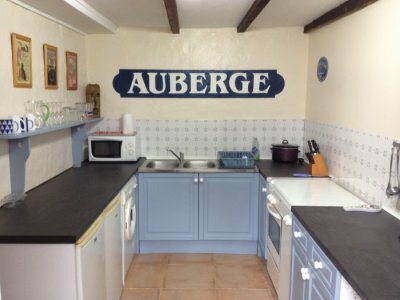 Surrounding Area: Verteuil-sur-Charente is 2.5km from the cottage. In the village are all amenities including a baker, post office, a butcher/charcuterie, general store/tabac, chemist, hairdresser and bar/restaurants. The beautiful château stands overlooking the village and the pretty river Charente meanders south towards Angouleme. Ruffec has large supermarkets, various shops, bars and restaurants, indoor pool, 2 screen cinema and a weekly market. Within easy driving distance for a day out are the towns of Poitiers (Futuroscope), Limoges (porcelain), Angouleme and Cognac. Kids will enjoy Monkey Valley 30 minutes away. The coastal town of La Rochelle and west coast sandy beaches are about one and a half hours drive. The medieval town of Confolens is 45 minutes away. It is particularly famous for its international folklore festival of song and dance. Oradour-sur-Glane is a village that was brutally destroyed by the Nazis in WWII and now preserved as a memorial. It stands today exactly as it was left on 10th June 1944. A very moving and worthwhile experience to visit it. The area has a lot to offer for interesting days out. Wood burning stove in the lounge and electric heaters in bedrooms and bathroom. Note: Free use of owners telephone to landline numbers in the UK and Europe. Unlimited Broadband WiFi internet access. English Freeview Satellite Television. Children welcome. Large garden for kids to run around in and 'let off steam'! The owners live on site. Longer lets can be made from September up to the end of June depending on availability Off-road parking. Pricing Info: Rental is per calender month inclusive of electricity, wood, gas, water and use of phone for calls to UK, Europe and North American landline numbers. 25% deposit to secure the booking with the first months rent (minus the deposit) due 4 weeks prior to start date. Rent is then payable a month in advance. I require a security deposit of 200 euros returnable at the end of rental, minus any costs for damage etc. 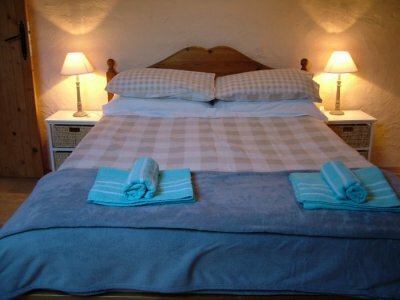 Bed linen, kitchen linen and towels are provided. For rentals of less than one month, between October and the end of March, the rate is 200 euros per week, from April to the end of June the holiday let rate applies. See our website for prices. Rates include bed linen, kitchen linen, bathroom towels, electricity, gas, wood, water. Availability: This property is available for longer rentals: Oct to June. Longer lets can be made from September up to the end of June depending on availability.